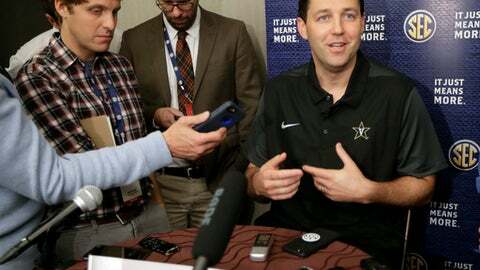 NASHVILLE, Tenn. (AP) Vanderbilt coach Bryce Drew has heard Matthew Fisher-Davis shooting by himself at night and has seen the senior guard working to be more aggressive this season. Fisher-Davis is best remembered for rallying Vanderbilt from 15 points down in the NCAA Tournament last March, only to inexplicably foul Northwestern’s Bryant McIntosh on purpose when the Commodores had a one-point lead with under 15 seconds left. McIntosh knocked down both free throws to put Northwestern ahead for good in the Wildcats’ 68-66 victory . Teammates have seen some of the criticism Fisher-Davis has gotten on social media. Senior guard Riley LaChance says the Commodores never would’ve had a chance if not for Fisher-Davis in that game, and LaChance says the Commodores can’t wait to see how much he has grown. Fisher-Davis is one of three seniors, along with LaChance and forward Jeff Roberson, trying to lead the Commodores to a third straight tournament berth for the first time since 2010-12. THREE-POINT TIME: Under Drew, Vanderbilt set a school record by making 337 3-pointers last season and led the SEC by hitting an average of 37.7 percent beyond the arc. The Commodores also had a league-high 9.9 3s per game. LaChance knocked down 49.3 percent of his 3s to lead the SEC, and he had lots of company. Five other Commodores knocked down 30 3s or better last season, and LaChance is among four 3-point shooters back this season. The Commodores made a school-record 19 3s on Dec. 6, 2016, against High Point. They also can knock down free throws, hitting 77.6 at the line last season for the second-best rate in school history. TOUGH SCHEDULE, TAKE 2: The Commodores posted the toughest strength of schedule and toughest nonconference schedule in the nation in Drew’s first season. The coach has tried to top himself this season. The first road game is a mile away at Belmont. The Commodores will host Southern California, Kansas State and Middle Tennessee, which all made the NCAA Tournament last season. They also have a neutral-site game against Virginia in the NIT Season Tip-Off. Vanderbilt also will visit Arizona State. TCU will visit in January as part of the SEC/Big 12 Challenge. There also is a home-and-home against Kentucky. ROAD WARRIORS: How the Commodores fare will depend on whether they can continue, or even improve, their success away from Memorial Gym . They won five SEC road games last season with victories at LSU, Auburn, Texas A&M, Arkansas and Tennessee for their best road record since 2010. That helped Vanderbilt go 10-8 in league play and tie for fifth in the SEC. HITTING 1,000: The Commodores are among only three programs to make at least one 3-pointer in every game since the shot was introduced. That streak stands at 999, with only UNLV and Kentucky having longer streaks. The Commodores open the season Nov. 10 against Austin Peay.